On Thursday Amazon announced Project Kuiper, its plan to launch a constellation of satellites to provide global high-speed internet. Interesting to note, Amazon - not Blue Origin, Jeff Bezos’s rocket company – is making this investment, its second attempt to leverage satellite technology in the last six months. In September 2018, Amazon partnered with Iridium to use its satellite constellation for internet of things applications (IoT) on Amazon Web Services (AWS). Accounting for roughly 40% of all tech spending globally, communications seems to be AWS’s next wave of expansion. Its Infrastructure-as-a-Service offerings have captured large portions of the $200 billion data center market while its wide-ranging Software-as-a-Service lineup, particularly Aurora and EMR, has taken significant share from Oracle and IBM. Until now, AWS has had little presence in the $1.4 trillion communication services market, the largest segment of IT according to Gartner, as shown below. Disrupting the communications space could sustain years of rapid growth in AWS, Amazon’s most profitable business. That said, Amazon is not alone in its new space venture. SpaceX, OneWeb, Boeing, Telesat, and others have their own plans for space-based internet. Preparing for first steps on a long journey, Amazon already has listed job postings for the project on its website. ARK is excited to see another innovative company joining the new space race. Based on presentations at this year’s AACR conference, companies focused on diagnostic tests for cancer increasingly are using epigenetics to improve their accuracy. Epigenetics incorporate changes in the genome other than mutations in the underlying genetic code. As an analogy, if a DNA sequence were a document, epigenetic alterations would be in bold type or italics but would not change the words. Unlike in the document analogy, however, epigenetics can alter gene expression, which can be dangerous. In contrast to the genome, the epigenome changes in response to external factors like the environment, stress, or diet. Many diseases like schizophrenia and various cancers are triggered by epigenetic changes, suggesting that diagnostics that incorporate them will be more accurate than their counterparts. The most common epigenetic alteration is called DNA methylation, which heretofore has been prohibitively expensive. Although DNA sequencing instruments are necessary to generate both genomic and methylation data, methylation involves pretreatment with harsh chemicals and requires more sophisticated bioinformatics tools, adding significantly to the cost. Recently, researchers have learned that layering methylation data on top of genomic data improves diagnostic test performance. Occasionally, clinicians find variants of unknown significance in the genome, suggesting that a mutation is loosely connected to a disease. In analyzing the methylation data, clinicians can understand more about the variant status of a mutation. With the optimization of methylation workflows, diagnostic tests are likely to increase in accuracy. Are IEOs the Reincarnation of ICOs? Just when the momentum behind Initial Coin Offerings (ICOs) had ground to a halt, a new - perhaps more powerful - phenomenon has emerged: Initial Exchange Offerings (IEOs). First popularized by Binance Exchange’s Launchpad, IEOs are offerings by exchanges trying to leverage their network effects by raising funds for new projects. As both counterparties and distributors, exchanges “block link” and charge the projects fees for the use of their networks, take a percentage of the funds raised as commissions, and then provide secondary market support for the newly issued tokens. As ARK has observed in the past, the potential utility of these tokens is likely to be questionable at best. Moreover, this kind of fundraising could impact the long-term health of the crypto industry by creating significant conflicts of interest and hidden leverage. Enabled by low customer acquisition costs, Digital Wallets should be able to offer checking account-like services at a much lower cost than traditional retail banks, unleashing a new wave of demand: the unbanked. Today, banks pay $350-$1500 to acquire one checking account customer. Wells Fargo, whose acquisition costs seem to be roughly $950, spent $857 million on advertising and $515 million on postage, stationery and supplies in 2018. According to our research and in contrast, Digital Wallet companies such as Square and PayPal can acquire new users for as little as $15-20 thanks to the powerful network effects of their peer-to-peer payments applications, Cash App and Venmo. If Digital Wallet companies were to offer checking account-like products, the lifetime value per checking account (CLV) would approach $1650 over the 16 years on average that consumers remain loyal to their primary checking account providers. 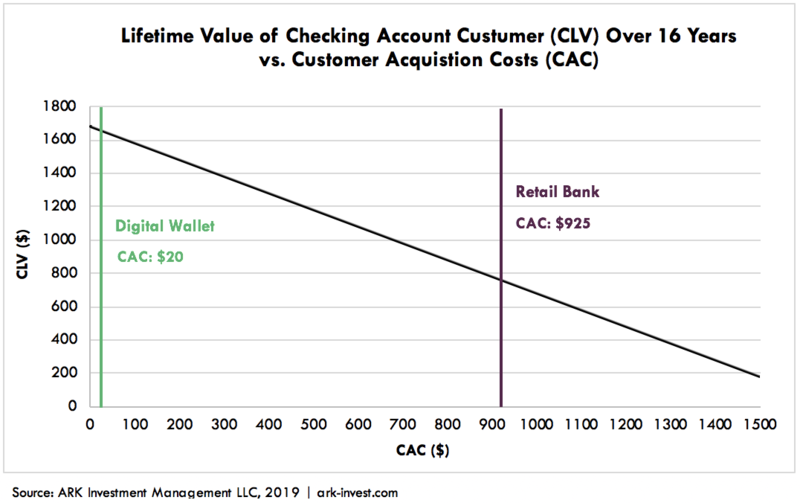 By contrast, the CLV at traditional retail banks averages $780 over the same time frame because of higher customer acquisition costs, as shown in the chart below. Important to note, these estimates assume that the revenue and cost structures of Digital Wallets are identical to those of Retail Banks, highlighting only the 20- to 70-fold difference in customer acquisition costs. In other words, because Digital Wallet operators are not burdened with the costs of bricks and mortar, they could deliver profit margins and returns on invested capital significantly above banks and other traditional financial institutions. Our research also shows that Digital Wallets could serve customers profitably even if their lifetimes are much shorter than 16 years and their account balances are much lower than that of the average retail bank. Because of competition and increasingly digital-savvy consumers, bank loyalty and customer lifetimes are likely to decline, a brewing problem for banks as the average checking account takes 9 years to turn profitable and, even then, becomes unprofitable when its balance drops below $6500. We believe Digital Wallets do not face these profitability constraints. Based only on customer acquisition cost differences, they could offer checking accounts profitably almost immediately for account balances at $40 or higher, offering access to the 20 million people in the US who currently do not have a checking or saving account. Square’s Cash App already is capitalizing on this opportunity, given its penetration of states where unbanked rates are high. Thanks to low customer acquisition costs, Digital Wallets now can bank the unbanked in a way that traditional banks cannot.